You were totally going to get a quesadilla recipe today. But food can wait. I spent my Easter Sunday at the movie theater. After 2 weeks, I went to see The Hunger Games. Why did I wait 2 weeks? Well, I kinda wanted to save it so I had something to do on Easter. I don't give this kind of praise on the regular, but I thought it was just as good as the book. I left the theater fulfilled and wanting more. I was glad that I could come home to read Catching Fire. So let's start with the cast. I think the best thing about this movie was the casting. I loved being able to put faces to the characters I had previously only envisioned in my head. They made all the right choices in all the right ways. Jennifer Lawrence?? Hells, yes. I love her movies. She is the perfect Katniss. She can act. Verbally and through expressions (imagine that, K. Stewart, imagine that). Also, Katniss is a badass. She's an excellent role model for girls. Liam Hemsworth? He's pretty much how I pictured Gale. Tall, rugged, the outdoorsy boy next door. The only bad part is that I wanted to see more of him. Josh Hutcherson as Peeta. Hmmm..I struggled with this. I wavered between Team Gale and Team Peeta when I was reading the books. But honestly, I finished the series so long ago (September 2010), that I can't remember who I landed on. At the beginning of the movie, I wasn't into the Peeta character, but he became decidedly more endearing and attractive toward the end (I think it was the messy hair). In fact, I thought the cave scene with the soup and all would be majorly corny. But it wasn't! Somehow these actors were good enough to pull it off and make it believable. That sold me on Josh Hutcherson as Peeta. I enjoyed the way Katniss was "thinking" her way through most of the movie. A lot of the book is her thoughts, explanations, and inner dialogue. If you read it, you knew exactly what she was thinking as she appeared to be staring off into the distance. They didn't do the dogs at the end as they did in the book, with the eyes and physical characteristics of the dead tributes. I personally didn't care; that part creeped me out anyway. And by the time it got to this point in the movie, I was all distracted by the idea that Peeta might not be that bad after all. I noticed some reviewers pointing out that there wasn't a lot of lead-up to the Reaping. Once again, because I read the book and felt like I had all that stored away as prior knowledge, it didn't bother me. Without reading the book, it could be an issue. However, I would've loved to see some more Gale/Katniss hunting time. They didn't hit on the Avox with the cut-out tongues. They also didn't mention that time Gale and Katniss watched the boy being killed and the girl being taken away (and turned into an Avox) outside the District 12 fence. 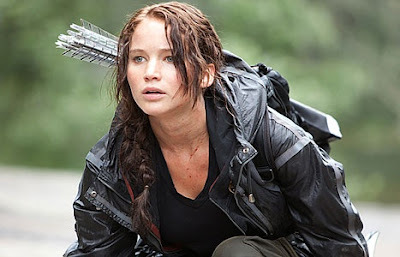 Katniss totally didn't listen for the electricity in the District 12 fence before hopping through it. Peeta's leg was much more seriously injured in the book. Katniss's eardrum didn't break during the explosion at the Cornucopia in the movie. What are you thoughts?? Did you see it? Are you going to see it? I know I've pretty much missed the boat here, but now I can't wait to re-read Catching Fire and get ready for sequel! I don't normally consider myself extremely observant, especially in movies, but between having very high expectations of it and seeing it (3) times, I noticed a lot of things too. 1. 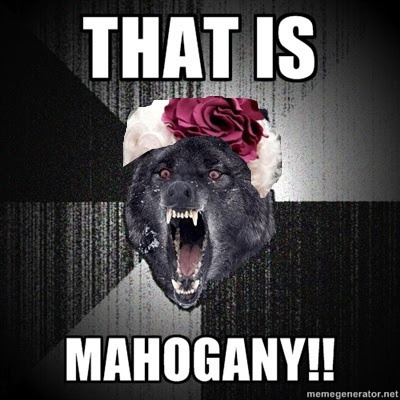 They completely changed how Katniss got the mockingjay pin, cutting Madge's character altogether. I get why they had to make changes like this..that would take up time to explain and what not, but still a little bothersome. 2. I liked the addition of the rebellion in District 11 after Rue's death - I don't think that was in the book...? 3. I agree about the avoxes - they totally didn't acknowledge them, though again, would have taken up precious time. 4. I LOVED Haymitch. Him and Katniss seemed to get along better than I'd imagined from the books, but I enjoyed it. 5. We got no dialogue from her prep team other than Cinna. 6. Loved Caesar Flickmann(?) as well. 7. Liked the addition of Seneca Crane's last scene - don't remember them describing the means of his death in the book, but the bowl of berries was clever. 8. Sigh...Peeta vs. Gale. I was definitely on Peeta's side from the books...but I think I've completely jumped ship. I think of all the cast, Josh Hutcherson was the worst actor. It's hard to decide if he played Peeta really well and he's just sort of boring, or if he just isn't a good actor, but I really didn't like it and anytime a scene felt forced or corny, it always involved him. 9. Loved the way her hallucination told the story of her father's death, but I don't know that someone who hadn't read the books would have understood. Either way, great cinematography. 10. The soundlessness at the start of the games, during the bloodbath, was epic. It added so much tension and suspense to the entire scene with just the loud ringing rather than actual noise. Sorry...clearly I've thought about this too much...I could seriously go on forever. I thought the camera work was great and very fitting. The soundlessness at the key scenes was also amazing. The supporting characters were all so good, but you're right. We didn't see nearly enough of them. Woody Harrelson, Elizabeth Banks, etc. I was Team Gale through and through, but now I'm wavering. I have a hard time READING through that cave scene because it seems so corny and awkward with the soup and the kissing and all. But I thought they really pulled it off! I've decided I only like Peeta when he has messy hair. Ha...that mullet-like comb-back thing did not work for him in the beginning. I also could go on for days. I think the bottom line, for me, is that this is an example of a movie that was wonderfully done after a book. It usually doesn't work that way! I agree! They did a really good job. I'm glad I re-read it right before I went because I enjoy remembering the book well enough to figure out what they changed/left out/added/etc. I thought the change with how Katniss got her pin was totally fine. Madge wasn't all that important of a character, even though I enjoyed her in the book, I thought it was fine they left her out. Gale was huge. I was thinking a shorter guy. I'm not 100% I liked when they showed him watching the Games. I don't know why. The Avox story was a definitely a good one, so I was a little bummed to see that left out, but, in the scheme of the series, it's not a huge element, so I get why they left it out. Haymitch I imagined MUCH older. Like 60s. But I totally enjoyed how they portrayed him in the movie. Rue I had a mental image of a scrawny, blonde, girl. I actually really enjoyed how they portrayed her. And I thought it was brilliant that they forshadowed what's to come when they panned to District 11 with the outbreaks. Really smart thinking with the movie. I agree with how you said Katniss was shown "thinking" a lot, which was really a great tip-off to the book and how her character was written. I was expecting them to follow the "muttant" scene but understand why they didn't. It would've been a hard task to accomplish without adding a ton more money to the movie budget. Once again, it wasn't hugely necessary. The only thing I would've liked to see was a little more focus on how there was a rift between Katniss and Peeta at the end of book 1. For me, the movie didn't seem to show that Peeta was really picking up much on the fact he was being used. Or if he was, he didn't seem to act as bummed as the character in the book. All in all, I really REALLY enjoyed the movie. The cast was amazing, the cinematography was astounding, and it was as true to the book as I could have imagined. And now that I've typed a novel, I will submit this comment and hit the hay. I'm glad you went to go see it and enjoyed a day to yourself! I really really liked the movie, but I am not a harsh critic on most things! I agree that I wasn't in love with Peeta's character but liked him a little more by the end. I wish the next movie was coming out sooner! I'm already ready to see it!! I wasnt thrilled with movie, but I didnt hate it either. One of the things I thought they did poorly was developing the love triangle. Except for seeing Gale one time look weird when they kiss, you would never know that she struggles with it. Kev didnt read the books and he was terribly confused with the whole movie. I thought it was weird that they never mentioned 13 too since it is such an important development in the next 2 books! Hi! I'm visiting from Mingle Monday. =) I absolutely loved both the movie and the book, and I didn't mind the things they chose to add/leave out. I think it helped the story line along. Also, the way it was filmed didn't bother me, I didn't notice the shakiness that a lot of other people didn't like. I hadn't read the books, but I LOVED the movie. I definitely want to read the books now.